Before you begin to learn how to read a decompression table it is important to have one in your hand. 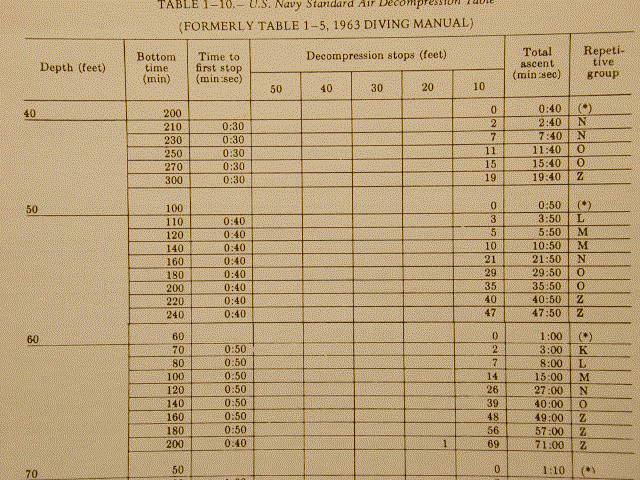 Please use the US Navy Decompression Table for this lesson. In the future it will be easy to switch to any other such as the PADI Recreational Dive Planner. This is a photo of the table we will be using. You will notice the Depth (feet) is the heading on the left and under that are depths 40, 50, 60, etc. The definition of a diver's depth is the deepest point reached during a dive. 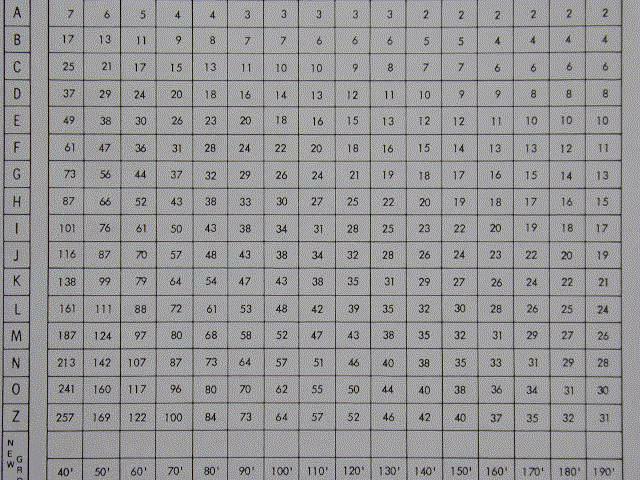 In all cases, numbers are rounded up to the next number on the table. For example, if a diver reaches 40' then the depth is 40'. If a diver reaches 42' then it is rounded up to 50'. You might wonder why the table starts at 40' when we found out a diver going to 33' could get DCS. If you did go to 33' you would have to round the number up to 40' and that is where the table depths begin. How does a diver keep track of the deepest spot reached on a dive. Many depth gauges have a second needle that travels with the needle that measures the depth. The second needle, called a Maximum Depth Indicator, will remain at the deepest depth encountered on the dive. Divers wearing computers will have the deepest depth recorded on them as well. The second column of the table is the bottom time. Above you can see the bottom times for the 40' depth are 200, 210, 230, etc. The times are in minutes. The definition for the bottom time is the time it takes to go down and the time spent on the bottom. It DOES NOT include the time spent on the surface (swimming, standing in the water, etc. ), nor does it include the time spent coming up. The first bottom time you see for 50' is 100 minutes. The times are also rounded up so if you spent 107 minutes at 50' you would use the 110 minutes. The third column, Time to the First Stop, we will not deal with until later. The middle of the table at the top shows you 5 numbers starting with 50 and then reading to the right 40, 30, 20, and 10. These are decompression stops and are listed in feet. Look carefully at a 40' dive for 210 minutes. To the right you will note the number 2 found under the 10' column. This is serious! What it means is that if you went to 40' and stayed there for 210 minutes you could get decompression sickness if you surfaced without stopping at 10 and hanging there for 2 minutes! In a sense you are trapped under water! Having to stop and de-gas on the way to the surface is risky business. What if you ran low on air? What if you had an emergency and had to surface? Having to stop at a depth prior to surfacing is known as a having a "Ceiling." You are required to stop on the way up. And, stopping to de-gas is known as "Stage Decompression." You should always do your scuba dives so that you are not down deep enough or long enough to acquire a ceiling and be forced to stage decompress. Looking carefully, you will notice the second column from the left lists all the No Decompression Limits (NDL) for each depth. The last one in the photo above shows the NDL for 100' to be 25 minutes. Notice the last one on your chart says the NDL for 190' is 5 minutes.Also notice there is no NDL for dives less than 30'. Also notice, the deeper a diver goes the less time that is allowed before you acquire a ceiling because you have exceeded the NDL. So, now you can read a decompression table. You now know to avoid staying down past certain times for listed depths, and if you accidentally did stay down longer then the no decompression limit you know that you would acquire a ceiling and have to stage decompress on the ascent. There are still a few more things to be learned in order to keep you from decompression sickness. Let's assume you have been diving and safely ascended to the surface. Nitrogen was added to your body while you were under the water. You are now boarding the boat. As you leave the water you still have an elevated level of nitrogen in your body. In fact, it could take as long as 24 hours for the extra nitrogen to be eliminated entirely! Is this of major concern? It is if you plan to go on another dive. If you decide to go on a second dive the decompression table you just learned to use would not be accurate. Because you would be starting with excess nitrogen, it would be very possible to get decompression sickness even if you followed the decompression table as was done on the first dive! This second dive is called a "Repetitive Dive." Repetitive diving requires additional information to ensure the diver's safety. You must know when you leave the water how much extra nitrogen you have in your body from the dive you just did. Now the Navy could have put that pressure information in millimeters of Mercury but it would be too technical and somewhat confusing to their divers. Instead they used letters of the alphabet to represent pressure. A little nitrogen left over from a previous dive might be represented by the letter "A." A lot of nitrogen left over from a deep and/or long dive might be represented by the letter "Z." The lower down in the alphabet, the more the nitrogen in the diver's body. So, it is important to be able to find out what "letter group" you are in after diving. This "letter group" is also known as the "Repetitive Group." The chart above is found on the lower left of the table you should be using. You will notice the words, "Repetitive Group" listed at the top. Notice the letters found on the portion of the table above run from A through H. Those are the letters that are going to tell the diver how much nitrogen they have in their body. Let's say you did a dive to 50' and stayed down for 35 minutes. Go down the depth column until you reach 50'. Go across from their until you find the time (35 minutes rounds up to 40 minutes). If you go straight up from there you will find the letter "F." That is the amount of nitrogen you have in your body from that dive. Check out a dive to 99' for 24 minutes. What Repetitive Group would you be in? If you found the answer to be "H" then you know what you are doing. If not, stop and figure out what you are doing incorrectly. Let's assume you are doing a dive that exceeds the no decompression limit. Those dives are found on the upper chart on the paper. At the end of each dive you will also find the Repetitive Group. Look at 50' for 120 minutes. This dangerous dive would give the diver a ceiling of 5 minutes at 10'. If you go further to the right you will notice there is the letter "M" under the Repetitive Group column. Try another problem: 89' for 99 minutes. 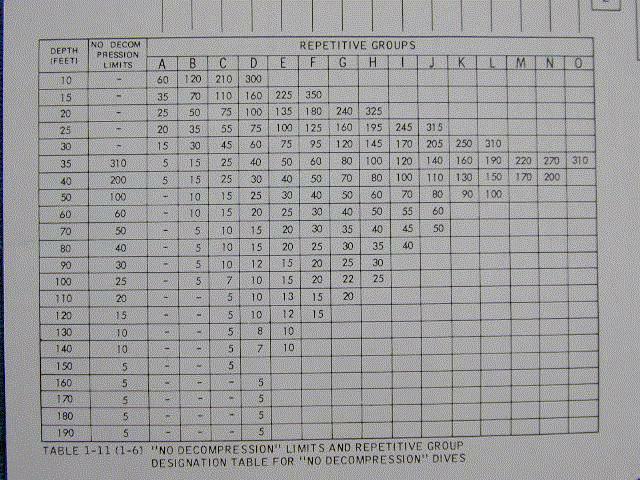 If you found the answer to be "Z" you are now able to find out any repetitive group for any dive using the 2 tables on the decompression paper. You want to make aa second dive. Because you have elevated nitrogen in your body from the first dive, you are going to be give a time penalty that must be added to the actual bottom time for the next dive. For example, let's say you left the last dive as a "D" diver. In other words, your repetitive group is "D." You plan to go no deeper than 50' on the next dive. Look at the chart above. Find Repetitive Group "D" on the left and go over to the column for 50'. You should notice there is a "29" in that box. That is your penalty, and is also known as the Residual Nitrogen Time (RNT). You must add 29 minutes to your next dive before you enter the water. If the dive to 50' is for 22 minutes you must pretend you were down for 51 minutes (22+29). That extra time is added to account for the extra nitrogen in your body from the first dive. Now you are going to ascend from the dive. You would look on the Decompression Table (lower left) and find 50' for 60 minutes. From there you would find you were now in Repetitive Group "H". That you would need to know if you planned to do another dive. To make sure you understand how to calculate the Residual Nitrogen Time, on the chart above you should notice the RNT for an "L" diver going to 90' would be 53 minutes. For an "N" diver going to 68' the RNT would be 87 minutes. And, a Z" diver going on another dive to 68' would have to add an RNT of 100 minutes to the dive. Let's do a problem: Your first dive is to 92' for 21 minutes. You get out of the water and decide to dive again to 52' for 25 minutes. What is the final Repetitive Group are you in following the 2nd dive? Find the Repetitive Group for the first dive: 92' rounds up to 100'. Round up the 21 minutes to 25 minutes. 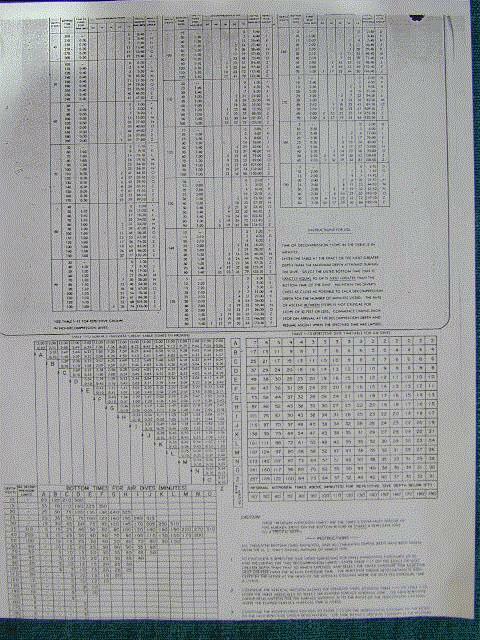 Look at the No Decompression Limit chart (bottom left) to find 100' for 25 minutes. Notice that you are at the no decompression limit and you are in Repetitive Group "H". Since you are going to do a 2nd dive to 52' for 25 minutes, the 52' rounds up to 60'. 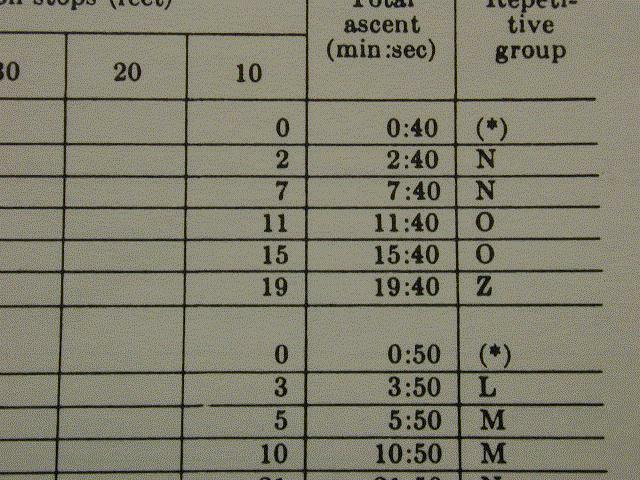 Look on the Repetitive Dive Timetable (right side) and find "H" on the left. Go over to the 60' column. The RNT is found to be 52 minutes. You should not do this second dive. It may result in decompression sickness. If you did the dive you would have to add the RNT to the actual planned time. Your dive to 60' would be for 77 minutes (25+52). The NDL for 60' is 60 minutes so you would have to stage decompress. Finally, the final ascent would be for 60' for 80 minutes. Looking at the chart you would have to stop at 10' for 7 minutes (ceiling) before exiting the dive. Your final Repetitive Group would be "L". There is one more thing to learn about the Decompression Tables: If you have completed a dive and decided to remain out of the water for awhile, you should be given credit for the excess nitrogen that is leaving your body. The longer a diver remains on the surface, the less excess nitrogen that remains in the body. In fact, after 12 hours, according to the Navy, and after 24 hours for sure, the nitrogen levels will have returned to normal. So, there must be some way to get credit for staying out of the water because the diver is degassing. You enter this table from the bottom and leave the table to the right. Let's say you have been diving to 50' for 50 minutes. That would put you in Repetitive Group "G". Find that on the table. Go straight up from the "G" and you will enter the Surface Interval Credit Table. Notice the first box encountered has 0:10 to 0:40 minutes in it. The box above that has 0:41 minutes to 1 hour and 15 minutes (1:15). Assume you remain on the surface for 2 hours and 15 minutes. That time would be included in the 4th box above the "G", because that box includes 2:00 to 2:58. From that box go to the right and you will see that you have changed to Repetitive Group "D"! So, by staying out of the water you have changed from Group "G" to Group "D". This degassing will now allow you have more time underwater on the second dive. Using the above chart, If you left the water as a "J" diver and stayed on the surface for 55 minutes, you would have changed into an "H" diver. 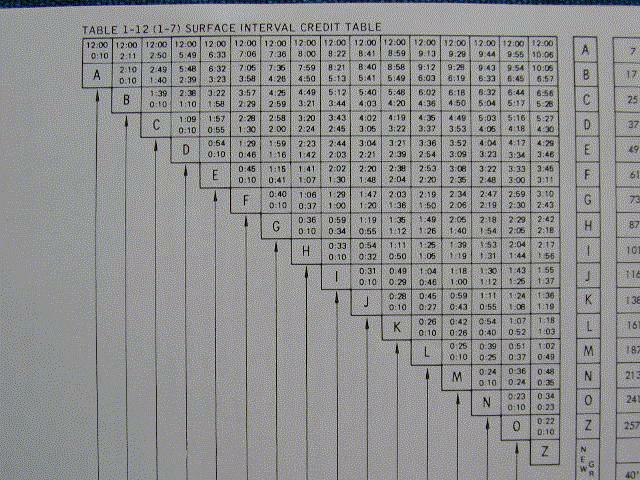 Also notice all the boxes just above the letters on the Surface Interval Credit Table start with 0:10 or 10 minutes. You might question as to what it would mean if you got out of the water and went back in within 5 minutes. According to the rules, if a diver stays out of the water for less than 10 minutes before diving again, the diver is considered to be on the first dive. In other words, it's as if the diver never left the water! If you stay out for 10 or more minutes you are on a second dive and the first is officially over. Underwater computers will do the same thing. If a diver comes to the surface and remains there for 10 or more minutes, the computer will automatically start logging another dive. And, if that computer only logs single dives, the first dive information, such as the depth and time, may be lost. Now it is time to do a problem that includes two dives and time spent on the surface between the dives. It would be wise to do this problem every so often so you do not lose the ability to try and remain safe from decompression sickness. Problem: The first dive of the day is to 109' for 9 minutes. Following that the diver travels by boat to a second dive location. It takes 1 hour and 12 minutes to get to the site and enter the water for the second dive. The second dive is to 45' for 51 minutes. What is the final Repetitive Group the diver will be in when they leave the water from the second dive? 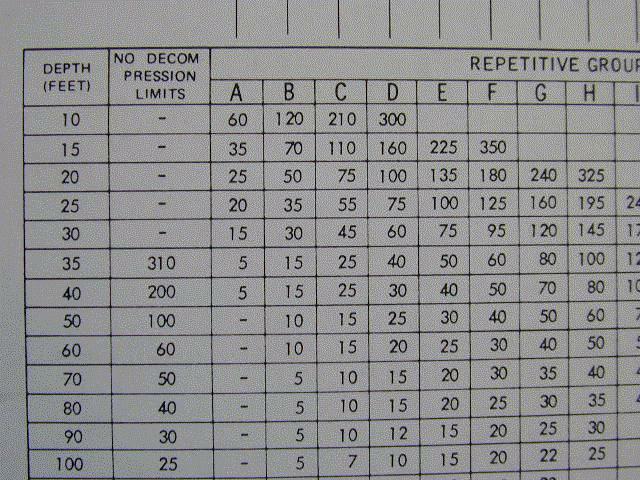 Look at the No Decompression Limit Chart (bottom left). Find 110' for 10 minutes. The Repetitive Group is "D". 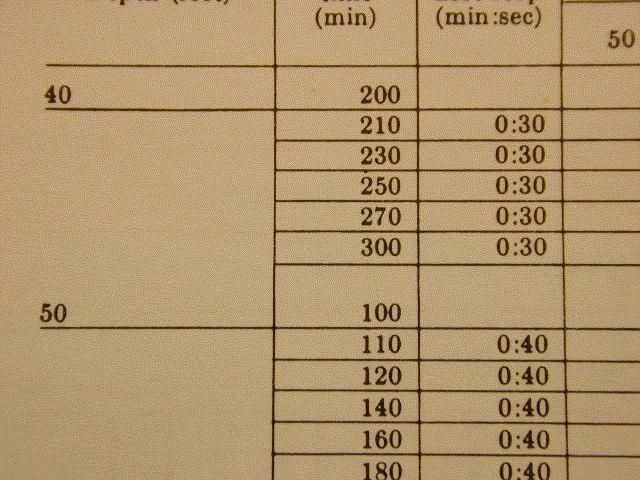 If the diver has a surface interval of 1 hour and 12 minutes, that would be in the second box above the "D" in the Surface Interval Credit Table. The new Repetitive Group is now "C". If the diver is going to 45' on the second dive, as a "C" diver he would have to add an RNT of 21 minutes to the dive. The dive is to be for 51 minutes. So, 51 minutes and 21 minutes RNT = 72 minutes. 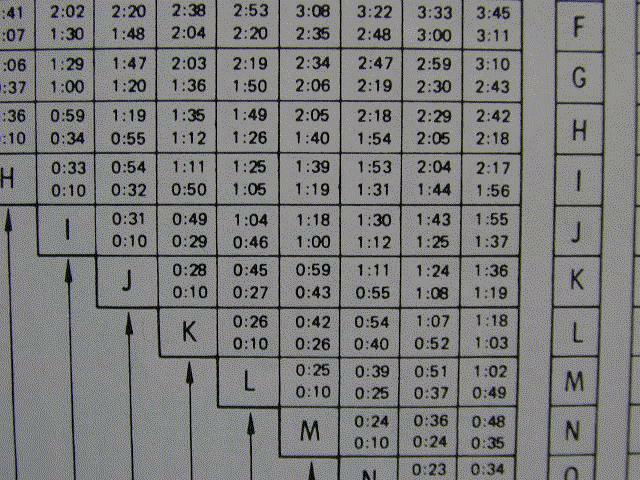 You find the RNT from the chart on the right called the Repetitive Dive Timetable. The second dive is 45' for 72 minutes. 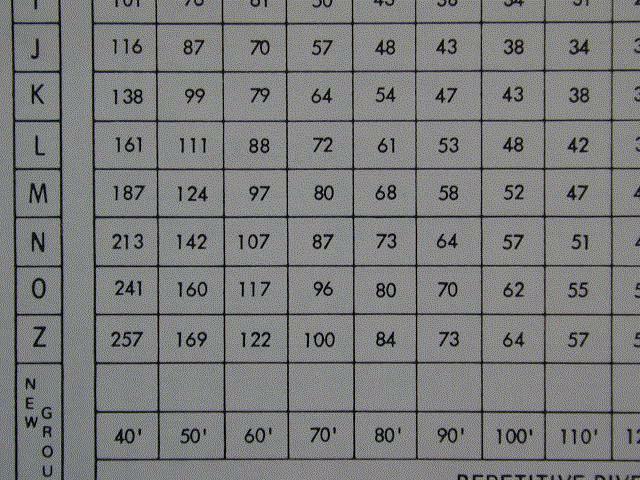 Using the No Decompression Limit Chart, One would look for 50' for 80 minutes. The final Repetitive Group would be "J".